Melmetal Pokedex & learnset for reference. YES! Finally Melmetal gets a chance to shine! Double Iron Bash is an essential damaging move for Melmetal. Earthquake handles common Steel, Electric, Poison, and Fire threats like Partner Pikachu, Alolan Muk, Mega Charizard X, and Alolan Dugtrio. Because of the lack of status recovery, Steel types, Poison types, Fire types, Electric Types, Rest, and Partner Eevee's Sparkly Swirl are all, so a big part of the Meta is avoiding and healing Status conditions. 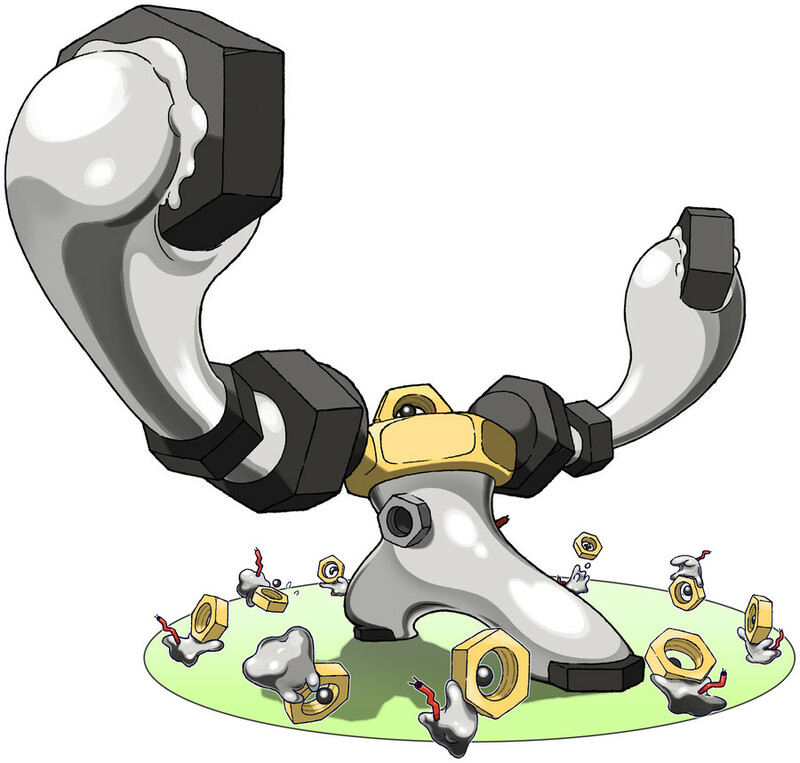 Melmetal fits well into this by dealing out Paralysis with Thunder Wave, Heals it's bulky build with Rest, and is immune to Poison. Ice Punch/Rock Slide hits Zapdos and a few other Pokémon better than its other moves, and prevents being walled by them. The set is pretty simple: Paralyze a target with Thunder Wave and spam Double Iron Bash and paraflinch them to death. Earthquake is for hitting Electric and Steel types that otherwise resist Double Iron Bash, namely Partner Pikachu, Magneton, and Alolan Dugtrio. Ice Punch hits Flying and Dragon types like Dodrio, Dragonite and especially Zapdos, who can wall it otherwise and potentially cripple it from paralysis. Rock Slide is another option, especially since it destroys Mega Charizard Y and Moltres, but those are uncommon. Rest is one final useful option since it gains a means of recovery and can counteract being burned without having to switch into Partner Eevee to cure it, but I don't like it because Zapdos can safely switch in on it. Melmetal mostly loses to the stronger Fire-type attackers and anything carrying Will-o-Wisp or Thunder Wave if your Partner Eevee gets KO'd. It can also potentially get burn leech stalled by Partner Eevee. Ice Punch sets lose to fire types, but Rock Slide sets lose to Dragonite. Stealth Rocks and Sparkly Swirl support is quite obviously welcome. I thought ev cap was 510? So all pokemon can have 200 on hp, attack, defense, and speed? Yes. Special Attack and Special Defence as well, for that matter. Sorry for asking so many questions but are IV’s still a thing in let’s go or should I put 31 iv? No problem. IVs are still around in Let's Go and behave the same as in previous games, so you'd best max them as well. What Pokemon is a good Toxic staller in Let's Go? For Let's Go Eevee: What are all the possible spawns and chances in the Pokemon Mansion? What are the base power for Eevee and Pikachu's special joycon move?